Brothers, I hope you are staying warm. It's a great time of the year to sit by the fire with a warm drink and a volume of poetry. Maybe even take the time to slow down and do a little hibernating. We just completed the second Men Writing for Change retreat. 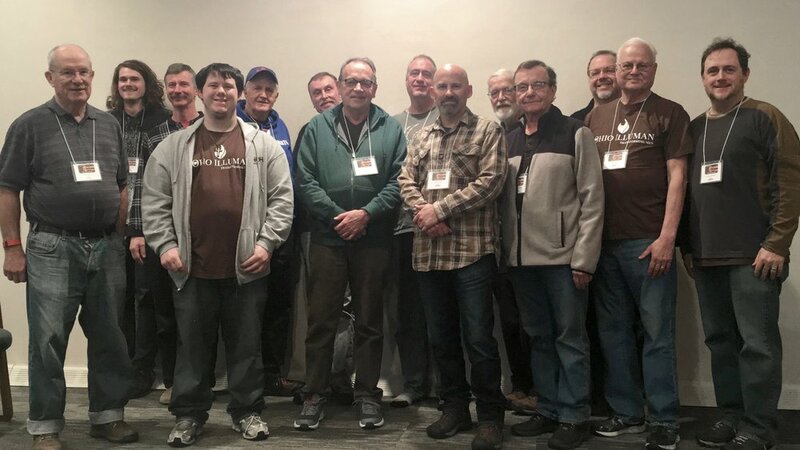 Over a dozen men from around the state joined Brian Mueller and Tom Sparough at the Jesuit Spiritual Center in Milford for some drumming, play, contemplation, and exploration of their deepest selves through poetry and writing. This has become an annual event, and I encourage you to join us next time even if you have already attended before. There is always more to explore about our souls, and poetry is an excellent excavating tool. Brian has several volumes of his poetry available at Digital Alphabet, and you can also sign up to receive his Poem of the Day. Tom has three books on Amazon including his most recent, Mr. Baitenswitch. Brad will be inviting us to use every part of ourselves, and all within us, to embody the Wisdom of the Enneagram. And instead of a lecture-dominated approach, equal time will be given to embodiment of each Enneagram type through Gurdjieff movements and meditative practices. This retreat has been developed around Illuman’s Journey of Illumination and includes the five touchstones: Gathering, Centering, Connecting, Releasing, and Serving. These touchstones are not an afterthought to the retreat but foundational. Those familiar with the Enneagram may be asking, “Why should I attend this Enneagram retreat when I already know my type?” We want you to know this retreat is designed to move past the discussion of the characteristics of each type and dive deeper into the “why” of each type. The retreat is designed to look at the Enneagram as a multi-faceted tool and not a flat personality system. Our Enneagram type is what shows up when we don’t. We hope you will agree with him after joining with us. The newsletter would not be complete without a reminder to keep the Young Men’s Rites of Passage this July 2019 in mind. We need your help in locating prospective initiates and serving as an elder on the rites.